TubeNet • View topic - Austin Howle - Montreal Symphony - Sellmansberger Solo Mpc. Austin Howle - Montreal Symphony - Sellmansberger Solo Mpc. Austin had some of our mouthpieces, but is more accustomed to flatter-profile rims...so he'll finally be using them. He stopped in for a bell-swap (late 1970's B&S "Symphonie" 6V F tuba). It was pretty frantic, because he (depending on others for transportation) showed up two hours late...and the next stop was the airport. We did find a minute to make a funny video...' will post later. Austin showed up (due to issues with the person supplying transportation) after 12:00 noon - needing to leave absolutely by 2:00 P.M. to catch a flight back to Montreal. 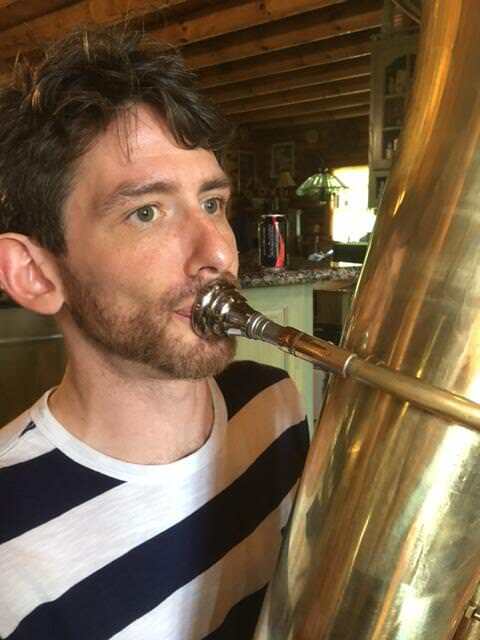 - remove the original bell from the instrument. - solder on the new bell, mouthpipe, mouthpipe brace, thumb ring.